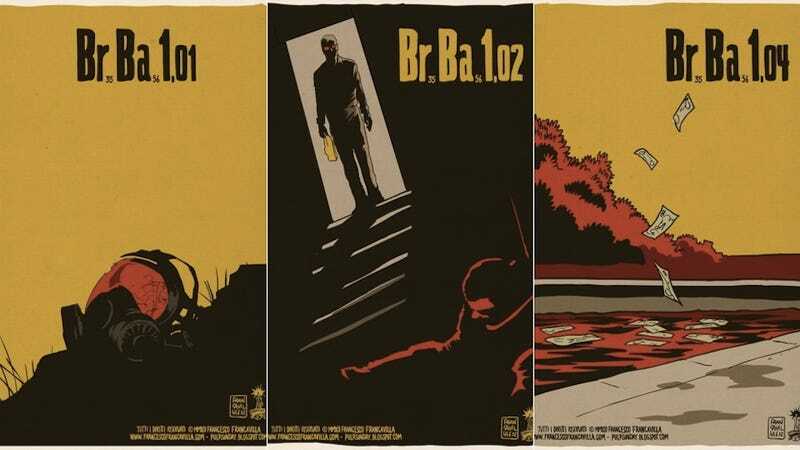 As we prepare to bid farewell to Breaking Bad, let's revisit the key images of episodes from long ago—and not so long ago—with these episode posters by Francesco Francavilla. Francavilla is a favorite artist here at io9, and these posters are a perfect example of why that is. He doesn't just explore capture a specific visual from each episode; he also conveys the sense of menace that we've come to associate with Walter White and many of the other players in the Albuquerque meth scene. Many of the individual posters are extremely simple, but together they evoke an unsettling tone. These are just a handful of the posters Francavilla has up on Tumblr, which take us through Seasons 1, 2, and the latter half of Season 5. He's made an effort to keep the images spoiler-free, but if you aren't caught up, a few of the posters are rather suggestive. He'll post the episode for the finale after tonight's episode airs.